Percentage Difference in Excel (Examples) | How To Calculate? In this, we will learn how to calculate the percentage of difference in excel. Before doing that first we will understand what is “percentage” and what is “percentage difference”. I hope most of the people know what is a percentage and how to calculate it but for the people who do not know how to calculate the percentage, it will help them. It is nothing but a portion of share out of total share which is divided into 100 parts. Let us take an example of number 500 which is divided into 100 parts then each part will have 5. Now if we want to know 50 is how much percentage of 500. We should know how many 5s are available in 50. Divide 50 with 5 it will be 10 that means 50 is 10 percent of 500. A simple way to calculate the percentage is, take the same example above. How much is the percentage of 50 in 500? (50/500) X 100 = 10%. Hope it is clear how to calculate percentages. Take a portion of share in one cell and total share in one cell. Now apply the formula for a percentage as discussed above and as shown in the below picture. Now we will understand what percentage difference is, percentage difference is the conversion of a difference of two values into a percentage. Eg: A is the base value and B is another value, so A-B will give one value if we represent the A-B(difference) in percentage then it will be called as a percentage difference. To understand better please find the below examples. To calculate the percentage difference in excel is very simple and easy. 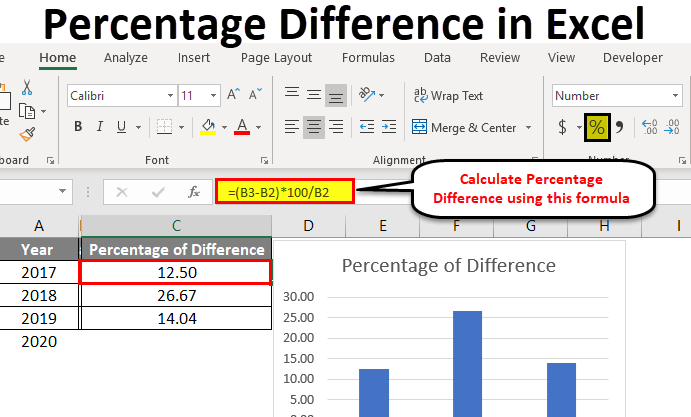 Let’s understand how to calculate the percentage difference in excel with some examples. Consider the employee’s population for 2018 and 2019 for a few cities. Now we need to find the increase or decrease in the growth of employees from 2018 to 2019 which is nothing but the difference from 2018 to 2019. Apply a simple formula to give the difference between 2018 and 2019. The formula will be shown in the below picture. We just need to drag the cell D2 downwards and the formula will be applied for all the cells. 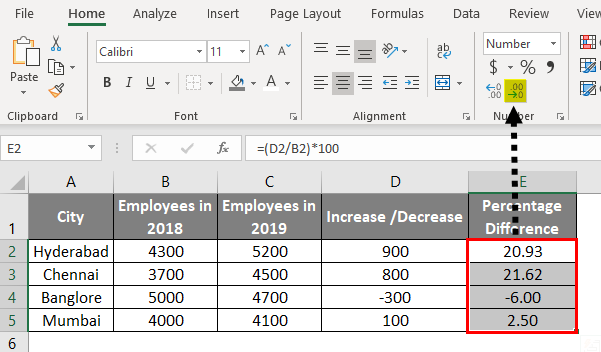 Now we found the difference then we just need to convert a percentage to find the percentage difference of employees from 2018 to 2019 in excel. Here base value will be 2018 values hence we should calculate as per 2018 data. For that divide the difference with the 2018 data. That means the difference value of Hyderabad should be divided with 4300, similarly Chennai with 3700, Bangalore with 5000 and Mumbai with 4000. The results will come like a decimal value. As discussed earlier the percentage should always be compared with 100 parts hence we multiple the results with 100 for the exact percentage. Once we multiply with 100 we got the results of how much percentage, but still, we have multiple numbers after the decimal point to reduce or round off, follow the below steps. Highlight all the cells and click on the option marked in the below picture until you have two numbers after the point. This is fine if still, we want to show with percentage symbol select the option percentage from the dropdown menu as shown below. As per picture, there is 20.93 percent increase in Hyderabad from 2018 to 2019, 21.62 increase in Chennai, 6 percent reduce in Bangalore and 2.50 percent increase in Mumbai. That mean 900 is 20.93 percent of 4300 similarly 800 is 21.62% 0f 3700, 300 is 6% of 5000 and 100 is 2.50% of 4000. 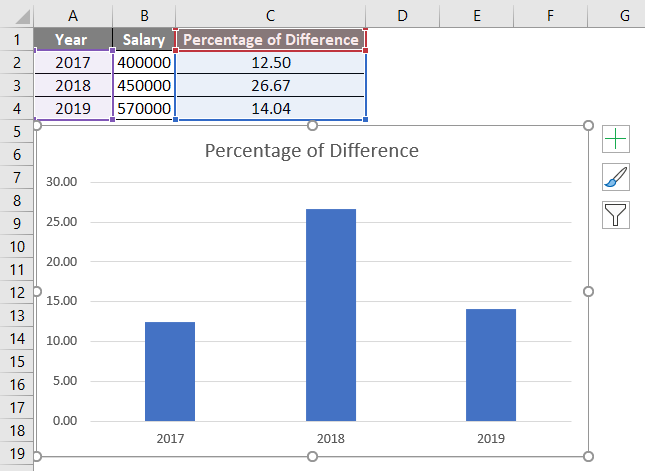 Consider the salary of an employee for three different years and will calculate how much percentage difference is his salary for every year in excel. After finding the percentage we will try to create a visualization for the same. Observe the salary of the employee. Now apply a formula to find the excel percentage difference in salary from one year to next year. Observe the formula, B3 which is 450000 from that we subtracted B2 which is 400000 and the difference multiplied with 100 and divide the results with B2 which is base salary 400000. That means the increase in salary from 2018 to 2017 is 12.5% in an amount it is 50,000. Similarly, it is 26.66% from 2019 to 2018 and 14.03% from 2019 to 2020 I did not apply for 2020 as we should have taken 2021 salary to calculate the difference as we do not have that data we cannot calculate the percentage difference in excel. Now we can create a chart to represent the percentage growth visually. Now select the year and percentage of difference column by holding the CTRL key. After selecting both the fields click on Insert option. Later click on the Recommended charts option which is highlighted with a red color box. From the drop-down, we can select the required form of chart to represent them visually. I selected one of the charts and below is the picture for reference. From the chart, we can observe the percentage change in every year. If the percentage is negative the bar will show under the baseline 0. Hope it is clear now how to find the percentage, Percentage difference and how to show the percentage change in a visual chart. 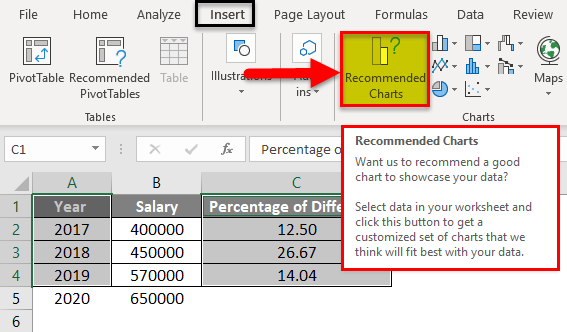 The percentage difference in excel is nothing but the representation of the differences between past value and a current value in the form of a percentage considering past value as base value or a difference between the current value and future value in the form of a percentage considering current value as base value. 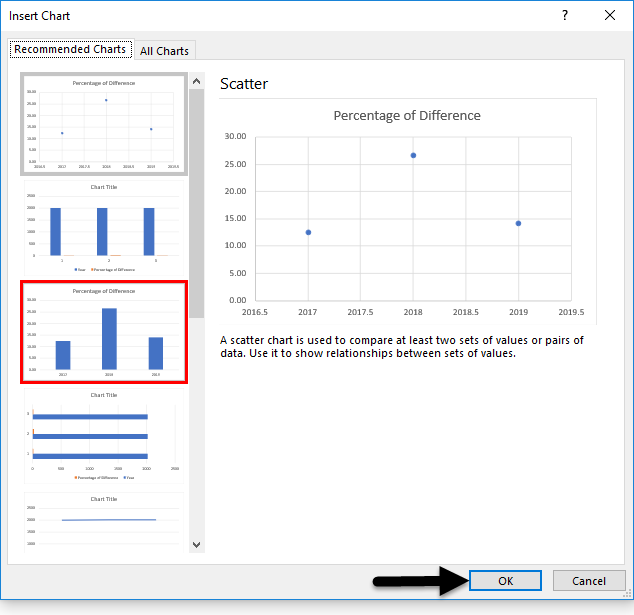 To find the percentage difference in excel first find the difference between the two numbers and divide this difference with base value. After obtaining the results multiply the decimal number with 100 this result will represent the percentage difference. We can apply round off if there are multiple numbers after a decimal point. The percentage difference in excel should not necessarily be positive it can be negative also. It depends on the difference between the values. The positive percentage represents the growth and negative percentage represents the decrement or decrease in growth. 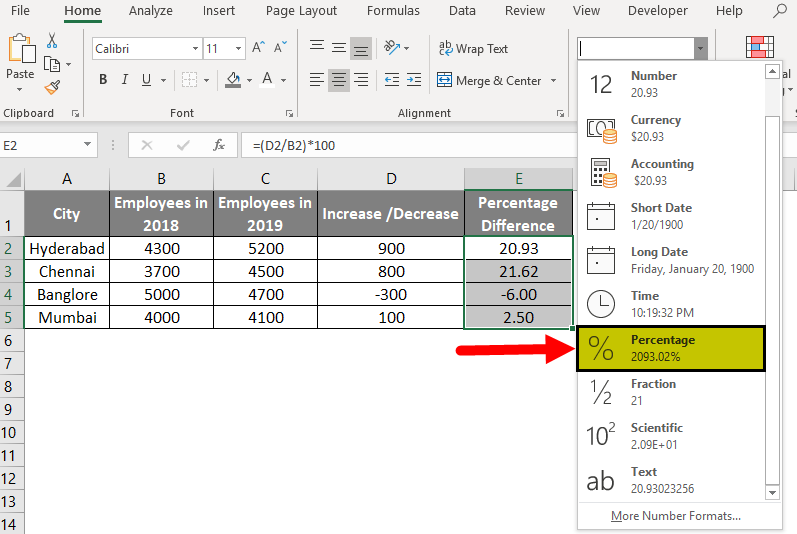 This percentage difference in excel helps to compare or to understand how much growth is happening in the business or profits or any results related activities. We can apply this percentage difference in statistics too.